This example represents a simple way to concat pictures of two or more video sources. To implement this example, you need to have OZEKI Camera SDK installed, and a reference to OzekiSDK.dll should be added to your Visual Studio project. 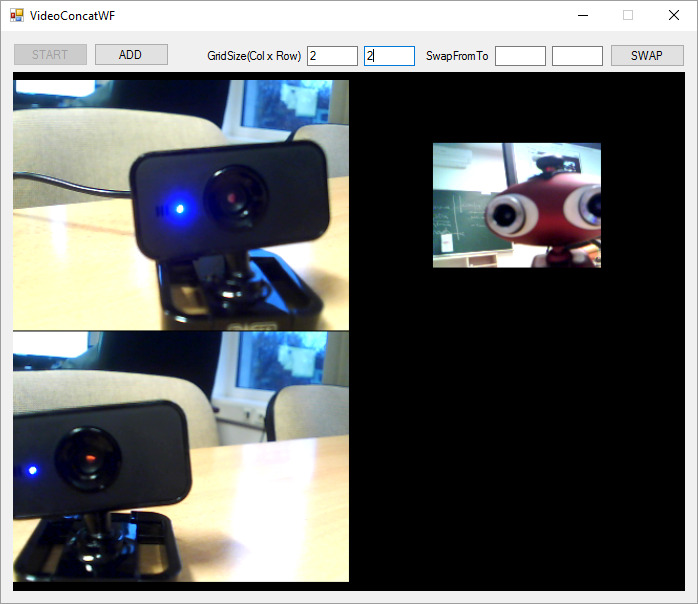 Using a videoconcat object you can integrate video sources from an IP camera, Web Camera or video file. Therefore you can create one source instead of numerous sources. You are also be able to specify how you would like to concat the sources: all in one row or one column or in a table. If you have two or more sources with different resolutions, the program finds the biggest resolution and provides it for every sources. If one of the resolution of the sources is less than the provided, the program set its picture in the centre. FrameRate:this property provides the framerate of the main sender. Senders:It gives back a list of the sources. Resolution:this property return the resolution of the combined pictures. VideoConcat(ViewMatrix desiredMatrix):by using this contructor, you can set the matrix which represent layout of the video pictures and initializes the other properties. VideoConcat(List<IVideoSender> desiredSenderList):by using this contructor, you can set the senders and initializes the other properties. Start():to start the concat function. Stop():to stop the concat function. SwapSources(IVideoSender from, IVideoSender to):change the "from" sender to the other sender called "to". SwapSources(IVideoSender source, int to):put the "from" sender to the the list of senders.It's index will be the "to" parameter's value. SwapSources(int from, int to):permute the "from" sender and the "to" sender in the sender list. AddSource(IVideoSender sender):to add a video source to the list. RemoveSource(IVideoSender sender):to remove a video source to the list. ClearSources():to remove the entire list of video sources. How to concat video streams into one source? Which OS are supported? Does it work with Windows 10? Yes,the SDK works with Windows 10. The following Operating Systems are supported:.